The benefits of accepting a cash offer on a house vs an offer that is reliant on securing a mortgage are speed and certainty of execution. All cash offers are much quicker to close, and you won’t have to worry about the financing falling through. 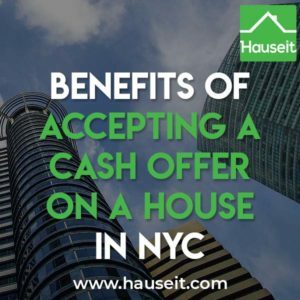 Furthermore, all cash offers are typically non contingent in NYC, meaning that the buyer won’t have a financing or sale contingency for the seller to worry about. Are All Cash Offers Always Better? When Should You Accept a Lower Cash Offer? No. All cash offers are not always better. Often times, all cash buyers will attempt to submit a lower offer vs competing buyers and the listing price. All cash buyers are often investors or vulture buyers who want to prey on weak or unsuspecting sellers who desperately need to sell fast, and who would be willing to sell below market value. We’ve seen too many cases of all cash buyers submitting offers below where other offers have already come in, and still making a case that their offer should be chosen because it’s more certain to close. Savvy sellers in this situation often ask the cash buyer whether they will match the highest other offer. In short, all cash offers aren’t always better because all cash buyers typically expect a 5% to 10% discount vs other buyers utilizing a mortgage. If the all cash buyer is looking to buy a primary residence, then the calculus may change especially in a seller’s market. In this situation, the all cash buyer may seek to match whatever the highest offer is to secure the deal. Pro Tip: Home owners should watch out for all cash offers from investors when they aren’t actively looking to sell. Investors will often target more elderly home owners with letters offering to buy their house all cash. Often times these elderly home owners will have no idea what their home is worth, and may get tricked into selling their house for a fraction of its market value. If you receive an all cash offer and aren’t satisfied with the terms or price, then you should counter offer the offer by telling the bidder that you have received interest from multiple parties and will be hosting a best and final offer process. Contrary to popular opinion, you do not need multiple offers or even a single offer to be able to host a best and final offer auction process. In fact, because real estate offers are not binding in NYC, you can hold a second best and final offer process and a third if you didn’t like the results. 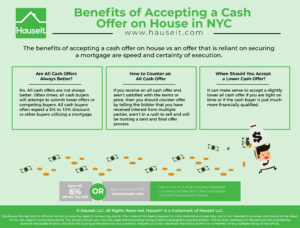 The primary point you want to convey to an all cash buyer is that while you certainly appreciate the many benefits of accepting a cash offer on a house in NYC, you’re not in a rush to sell and the price is more important to you. You can inform the cash buyer that the way the purchase is paid for does not really matter to you, and if the cash buyer wants the property they’ll have to improve their offer price. You can even bring up specific other offers that you have already received, or even indications of interest or offers from other buyers. Exactly what and how much you reveal about other offers is up to you. Some listing agents will refuse to disclose almost any information on other offers, while other listing agents are happy to disclose other offers to the cent. Pro Tip: Read our guide on how to counter offer real estate deals in NYC to learn more! And once you’ve accepted an offer, make sure to study up on how the offer to closing process works by reading our latest article on the time between offer and closing in NYC. As tough as it is to pass up more money from a higher offer that needs a mortgage, it sometimes makes sense to accept a slightly lower all cash offer if you are tight on time or if the cash buyer is just much more financially qualified. If you are doing a 1031 exchange or have already identified your next home, you may be short on time in which case certainty of execution is worth much more to you. Whatever the reason for you to want to sell quickly, the truth is that an all cash offer will close much more quickly and with a greater certainty than an offer that relies on a mortgage. In fact, all cash offers on a house or a condo in NYC can take under 30 days to close. In comparison, an offer that relies on a mortgage to close can take anywhere from 60 to 90 days to close on average in NYC. Keep in mind that if you’re buying a co-op, the timing advantage dissipates to a large degree because of the co-op board approval process. It doesn’t matter if you are financing your purchase or not, every buyer will have to submit a lengthy co-op board application, wait for condition approval, and show up for the co-op board interview. One of the key benefits of accepting a cash offer on a house in NYC is that cash buyers are frequently more financially qualified their buyers who need a mortgage. This becomes especially important when selling a co-op in NYC because of strict co-op financial requirements that are often more onerous than those of banks. This means that just because a bank may pre-approve a buyer for a mortgage doesn’t mean the co-op board will. As a result, if a buyer is financially on the edge of being qualified for a co-op, it can make much more sense to go with the more financially secure all cash buyer. Pro Tip: Learn how much co-op, condo or house you can afford with our handy Home Affordability Calculator. 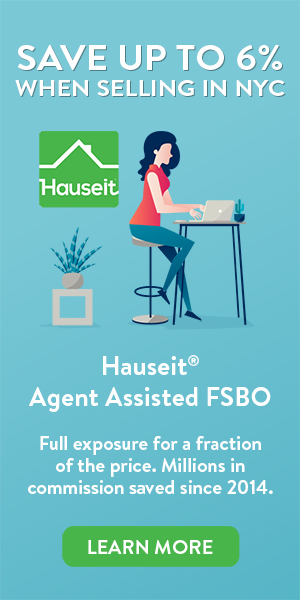 This useful calculator includes co-op and condo requirements such as post-closing liquidity, and allows the user to adjust the maximum Debt-to-Income Ratio allowed. How to Find a Realtor to Sell My House? What Is an Offer Escalation Clause in NYC? Can I Afford to Buy an Apartment in NYC?